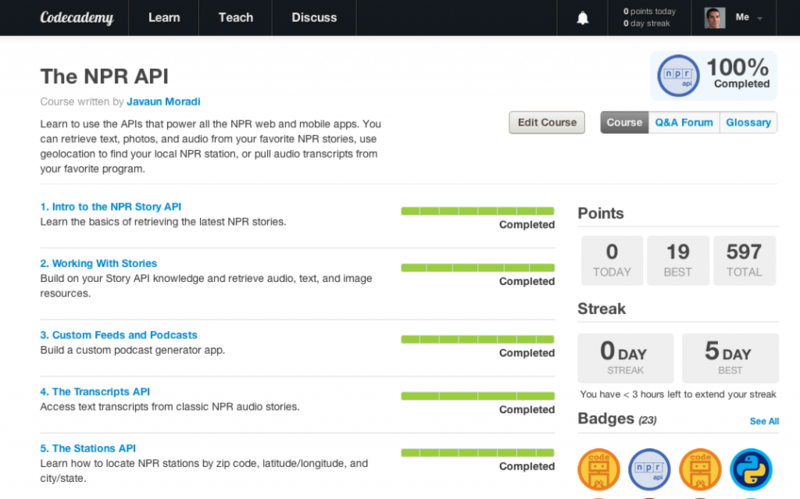 On Wednesday, Codecademy launched a full track of lessons on web APIs, and NPR was a launch partner with a course on the NPR API. There was a bit of media coverage. This entailed weeks of nights and weekend work but it was a ton of fun. For me, it started last November when I met Codecademy’s Sasha Laundy at DC Week. When she said they were about to pilot a track on APIs, I jumped at the chance. I’ve been a big fan of what Codecademy is trying to do since it launched. The world has a dire shortage of geeks, and they’re trying to make more. I’ve heard a few people scoff that you can’t learn to code just by spending 30 minutes here and there on Codecademy. To be clear — you can become a good programmer *many* ways as long as you’re willing to put in the time and struggle through difficult problems. But even my argument misses the main point. By removing all of the friction in working with a new technology, Codecademy is betting that a lot of folks who would never have tried programming in the first place will give it a shot. And some of them will fall in love and might even major in computer science. I have similar aspirations for the NPR API course on Codecademy. Perhaps the next generation of public radio listeners — those who don’t have radios and aren’t yet listening — will fall in love with this quirky open API that allows one to dabble with world-class content in the public interest. It’s important for us to be open and it’s important for us to be out there. Public radio has enough inspiration to share, we need the next generation of coders to help us realize our mission. This entry was posted in APIs on January 13, 2013 by Javaun.